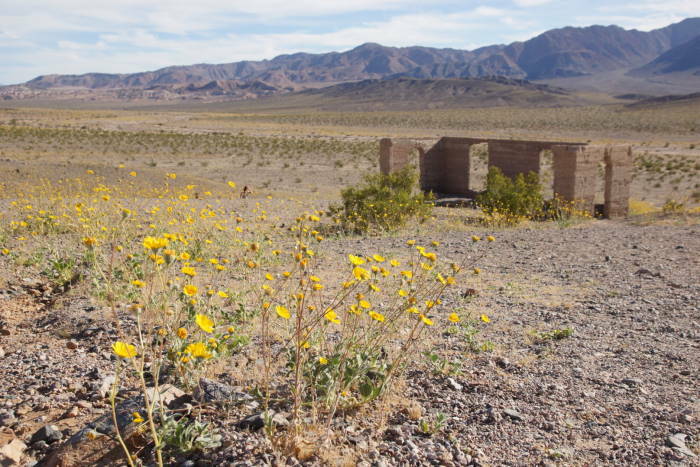 A remnant of Death Valley’s gold mining days still stands at the southern end of the park. If you make it all the way down here, you can check out the ruins of the old Ashford Mill — part of an operation that produced gold on-and-off for several decades, but was never very successful. 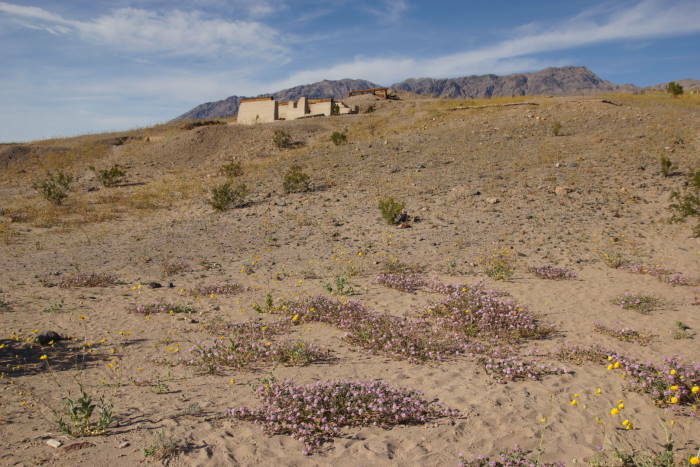 Ashford Mill Ruins are located south of Badwater, along Badwater Road. This is the last attraction before the road turns and heads up to Jubilee Pass (and eventually, out of the park as California Route 178). I was more interested in wildflowers than gold-mining history when I visited the Ashford Mill Ruins during 2016’s superbloom. 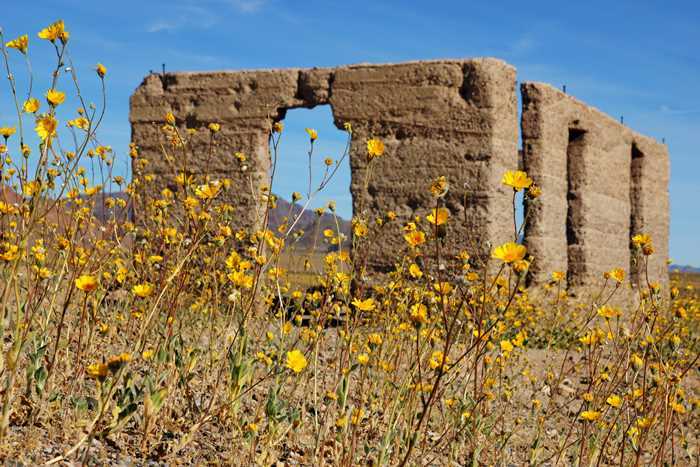 The site of the old ruins was also a great place to find wildflowers blooming. 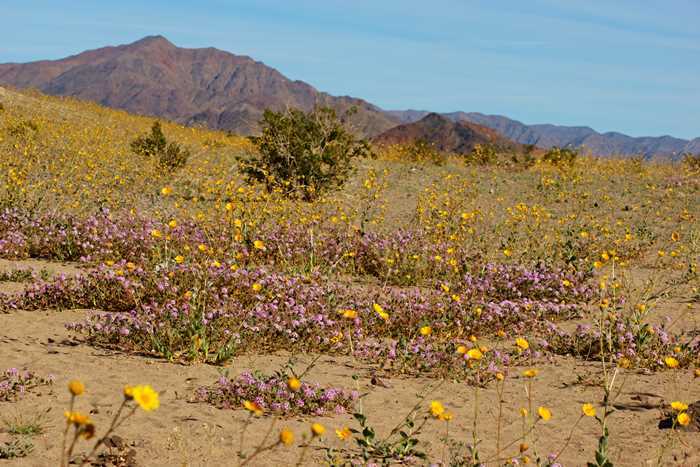 You may see some in late February or early March, even if it isn’t a superbloom year. The only building still standing at the site once served as an office building. While some of the walls still stand, the roof is gone. Hey, at least someone had a nice view from their office, though. On the hillside, sloping down from the parking area, you’ll also spot an old foundation. Back in the early 20th century, this would have been the more impressive building at this spot. It was the old mill, where rock that was pulled from the mine (about five miles away) was crushed and gold was extracted. That old mine is up on the hillside to the east. I don’t think you can see it from here, but I do believe that the rough dirt road that’s across the street from the mill might take you part of the way there. I’ve read that the road is washed out, somewhere up there, and you have to hike the rest of the way to see some of the remaining buildings at the mine. The mine and mill were owned by Harold, Henry, and Lewis Ashford. They worked the area starting in 1910, and after a few years they leased the operations to some other companies. None of them had much luck — the mine produced gold, but not a lot of it, and the whole operation was never very profitable for the Ashfords or the other companies. The website Legends of America suggests that operations probably ceased around 1941 — a long time to make an effort in such a harsh environment. But as I mentioned, I was more interested in the wildflowers, which were plentiful around the ruins, and just down the hill. If you continue south from Ashford Mill Ruins on Badwater Road, the pavement soon turns to the east, and the road climbs into the Black Mountains towards Jubilee Pass. 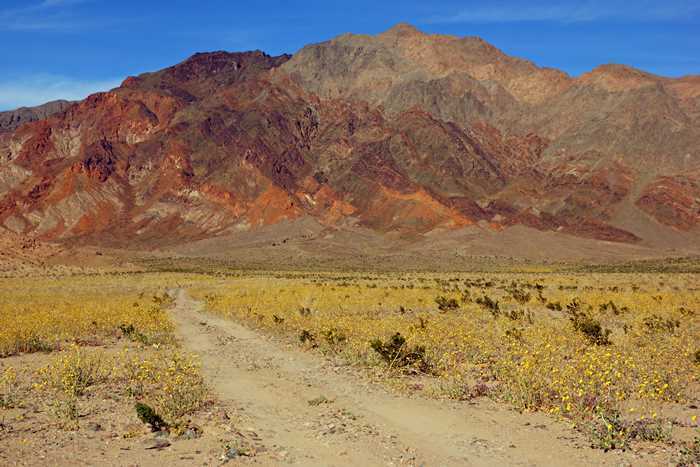 As of 2016, this road had been damaged and was closed a few miles ahead — meaning the only way out of Death Valley from here was to turn around and head back up Badwater Road. If you have a 4-wheel-drive vehicle and you’re not afraid of driving through patches of deep sand and possible flooding, you can continue headed south on Harry Wade Road. 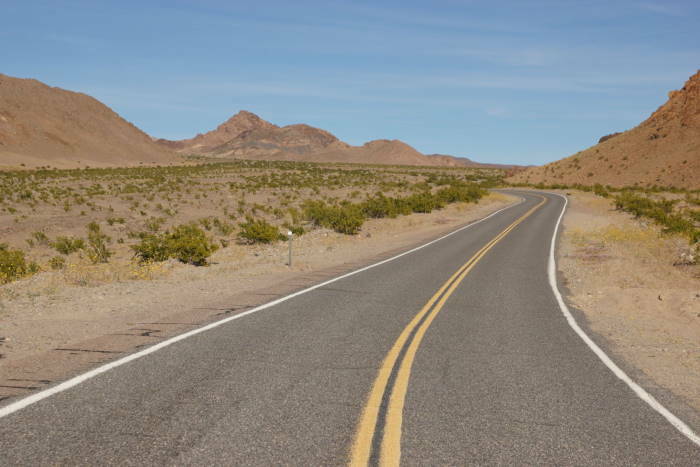 Eventually you’ll hit a better surface, and connect with Highway 127 for the drive down to Baker or up to Death Valley Junction. I wouldn’t recommend it if you don’t know what you’re doing. The old Ashford Mill site is interesting, but remote. I don’t think it’s worth going out of your way to visit it — especially if Jubilee Pass is closed, and Badwater Road is essentially a dead-end. While you probably shouldn’t make a special trip down here to see the ruins, you should check them out if you’re already in the area.